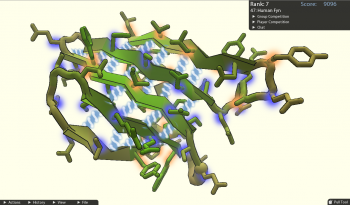 Using the enzyme folding game, Foldit, gamers solved a puzzle that eluded science for decades. It's getting harder and harder to shovel hate on gamers for not being productive members of society. Sure, we'd rather shoot a few zombies in Dead Island or take over feudal Japan in Shogun 2 than do our homework, but we have a skill set that is pretty damn important. And like Miss Mcgonigal posited, games can change the world when used to motivate people. That was the design behind Foldit, an online game created by a team at the University of Washington that taps people to predict the folds in 3D models of enzymes. The tens of thousands who've played the game were instrumental in solving the structure of a monomeric protease enzyme that could be used in defeating viruses like HIV. The results were published in the Nature Structural & Molecular Biology medical journal on Sunday. "Foldit is a multiplayer online game that enlists players worldwide to solve difficult protein-structure prediction problems. Foldit players leverage human three-dimensional problem-solving skills to interact with protein structures using direct manipulation tools," the paper reads. "Players collaborate with teammates while competing with other players to obtain the highest-scoring (lowest-energy) models." Why does science needs the help? Don't they have huge microscopes for this stuff? The problem is that microscopes essentially provide only a two dimensional picture of what is a 3D image. Figuring out how a squashed enzyme molecule would look in the wild is akin to modeling a plate of spaghetti to look like the Eiffel Tower. Science can sometimes use computer modeling to help this process but there are some structures that had been elusive to even our robotic brethren. "We wanted to see if human intuition could succeed where automated methods had failed," said the lead author Firas Khatib of the paper. "The ingenuity of game players is a formidable force that, if properly directed, can be used to solve a wide range of scientific problems." That's something even my mother couldn't argue with.